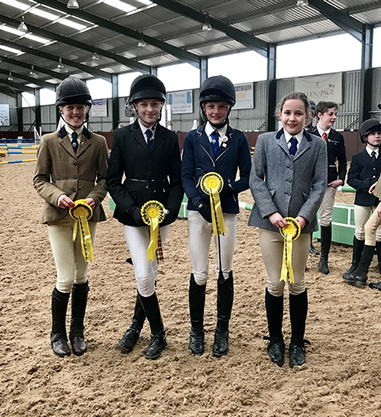 On Sunday 3 March, Dollar Academy pupils competed in the Kilgraston Scottish Schools Championships at Howe Equestrian Centre. Teams competed in both dressage and show jumping. Within the dressage competition, Dollar’s two teams placed 3rd and 4th. There was also a fantastic result in the show jumping category, with a well-deserved win for our 75cm team, who have now qualified for the national championships. Dollar Academy’s 85 cm and 95 cm teams placed 4th and 5th respectively within their classes. Commendations go to Esther Lang (J2) and Hannah Young (Form III), who secured individual placings in the dressage and show jumping. Many thanks to Kilgraston School for organising this event as well as a huge well done to all of our riders for achieving such great results in large classes with tough competition. Dollar’s competitors on the day were: Anya Pendaris (Form III), Evie Pendaris (Form I), Ester Lang, Aoiffe Peden (Form II), Isla Tebbutt (Form I), Jessica Evans (J1), Fiona Robertson (J2) and Hannah Young (Form III).